One of the many strengths of Pixar’s animators is their ability to turn creatures and objects into expressive, memorable characters. In Wall-E, the filmmakers have succeeded not only in bringing robot characters to life, but doing so with very little dialogue. While Wall-E is more serious than its predecessors, it has just as much heart, and enough cartoon wackiness to keep viewers of all ages entertained. A three-disc DVD set has a good batch of special features, though most fans will probably be satisfied with the one-disc edition. The movie is set in a future full of garbage. Humans have fled to a space cruiser while Wall-E units (Waste Allocation Load Lifter, Earth-Class) are supposed to clean up the mess. After 700 years, only one Wall-E is still operational. He’s a metal box with caterpillar tracks for feet, and soulful, binocular-shaped eyes. With his cockroach companion, he spends his days compacting trash and saving objects that appeal to him. When he wants a little entertainment, he watches a VHS tape of Hello Dolly. The story gets into gear quickly when a rocket ship shows up, depositing a sleek, high-tech probe called Eve (Extraterrestrial Vegetation Evaluator). Despite her tendency to shoot first and investigate later, Wall-E is smitten. 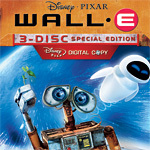 No sooner has Wall-E won Eve over, when she finds what she was looking for and her programming kicks in. The action then shifts to the space cruiser Axiom, where the temperature is always 72, and morbidly obese humans spend their lives on floating recliners, all of their entertainment and consumer needs seen to by robots. With the robot romance still in progress, the movie starts to ponder the fate of humanity. It’s not really the humans’ fault that they’ve failed to live up to their potential. They just don’t know any better. The current captain has an idea that there’s more to life than conspicuous consumption. Wall-E and Eve just might give him the impetus shake things up. The movie has plenty to say about the dangers of complacency and the importance of self sufficiency, not to mention the problems created by generating so much trash (the Wall-E DVD set is packaged in recycled cardboard instead of the usual plastic). Refreshingly, the movie has no true villain. Humans created the mess, but they also have the potential to fix things. While the animators show their usual knack for visual invention, a great deal of kudos should go to sound designer Ben Burtt, who is credited as the voice of Wall-E. He’s responsible for the sound effects of many blockbuster movies, including the entire Star Wars series. His experience in creating the “voice” of R2-D2 must have come in handy in making Wall-E express himself. Disc one has an interesting commentary track featuring director and co-writer Andrew Stanton. In the 1990s, he came up with the idea of a story about the last robot on Earth. Elements concerning the fate of humanity and the planet worked their way in as the movie was developed. Stanton insists that he had no agenda to promote. He has plenty to say about almost every aspect of the movie and never runs out of things to talk about. Animation Sound Design is an 18-minute featurette focusing on Burtt. Because the movie has very little dialogue, the sound was especially important, not just in setting the scene but in conveying the robots’ emotions. Burtt demonstrates some of high-tech and low-tech ways of making sound effects. Eve’s laser gun noise was made by plucking a stretched-out slinky, for instance. He also visits Disney’s archives to look at some of the contraptions used by the sound department. This disc also has Presto, the short that preceded Wall-E when it was shown in theaters. A new short, Burn-E, follows the misadventures of a welding-bot on the Axiom. The action in Burn-E happens at about the same time that Wall-E and Eve are dancing in space. There are two deleted scenes which were animated then cut, along with comments by Stanton at the beginning and end. Finally, there are two Easter Eggs. Disc two is divided into two sections: Humans and Robots. The Humans section has six featurettes, from 5-15 minutes long covering various aspects of the making of Wall-E including the cinematography, score, story and characters. Life of a Shot looks at a segment in which Wall-E compacts trash, then brings on many Pixar employees, who tell us how they contributed. Also in this section is The Pixar Story, an 87-minute film by Leslie Iwerks, which was reviewed last year by Movie Habit’s Matt Anderson. BnL Shorts are corporate public relations-style shorts from the Buy n Large Corporation, some snippets of which were used in Wall-E. Two more deleted scenes are on this disc. These scenes are a sequence of storyboard images with voices, and are followed by comments from Stanton. The Robots section is geared toward younger viewers. Bot Files has profiles of 28 robots from the film, including their names and functions. Lots of Bots is a DVD storybook. Choose the read-along option, and you get a three-minute animated children’s book. Choose the play-along option, and the action stops now and then for some simple interactive games. This storybook was more interesting an engaging than similar storybook features on other Disney DVDs. The third disc is the DisneyFile Digital Copy. This allows you to copy the movie to either iTunes or Windows Media Player, and from there, you can load it onto your iPod. The movie is presented in its original 2.35:1 aspect ratio, and the picture is flawless. For sound, there is a choice between Dolby Digital 5.1 or 2.0. According to the disc, the 2.0 track is best for those using a television without additional speakers. The 5.1 track sounded excellent in our home theater. After watching the movie, check out the deleted scenes and shorts on disc one. Check out Animation Sound Design as well, to get some insight into the making of the movie. Save the commentary track for another time. If you got the three-disc edition, check out the all of the bonus features on disc two at your leisure. If there are no young viewers, skip the Storybook section.